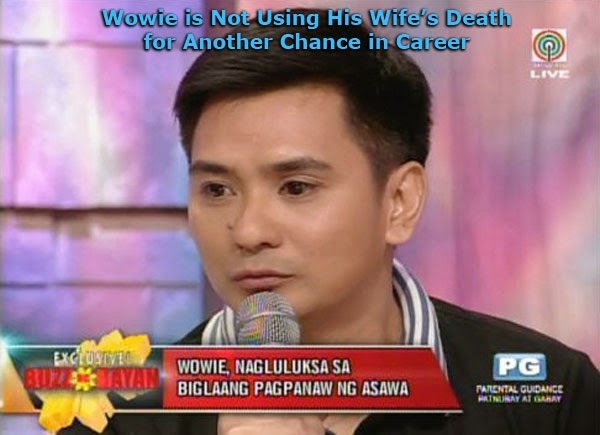 Manila, Philippines – Wowie De Guzman, a former member of Universal Motion Dancers and an actor on “Buzz ng Bayan” that the reason why he is granting interviews is because there are so many people who are curious about what is the reason behind the death of his wife. We have seen how Wowie wept on the television over the death of his wife named Sheryl Anne Reyes after a month of bearing a child. Wowie also stressed the fact that he is not asking for an interview or any television appearance and he also claimed that he feels like being a member of the industry thought he only has a limited visibility on the television. He did this because there are so many asking about what happened and he is ready to answer their queries. The former actor said that he could not help but blame himself for his wife’s death because he believes that he could have done something in order to prevent it from happening. Wowie said that Reyes died because of taking a muscle pain reliever and months of having unstable, erratic blood pressure and this is something that he blames himself with. Wowie narrated that his wife is “mataray” according to his description. When he noticed that her blood pressure was increasing, Wowie could not help but remain discreet because of his fear that Sheryl’s blood pressure could increase more. After bearing a child, that was the time when Wowie understood how hard it is to become a mom and bear a child. He promised that he will do everything to make her happy and that was also the time when his respect for his wife increased. Sherryl Ann Reyes was laid to rest last Saturday. In behalf of CenterTechNews, we extend our condolences to the De Guzman family.